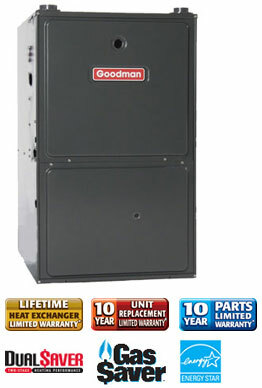 Goodman® brand gas furnaces can deliver warm, money-saving indoor comfort year after year to your home. Variable and multi-speed furnaces can provide enhanced indoor comfort by slowly ramping up to your thermostat setting rather than simply turning on at full speed. This alleviates the ‘cold air blow’ often associated with single-speed furnaces. Choose from a full line of Goodman brand gas furnaces that we believe offer the best warranty protection in the heating and cooling industry. To find a gas furnace that delivers maximum energy efficiency and savings, select a unit with the highest AFUE rating.